Honfleur has had a huge impact both historically and culturally and has been an inspiration for artists attributed with the appearance of the Impressionist movement. Make the most of your visit by taking your pick from our selection of hotels in Honfleur below. The historical Saint Catherine's Church is a huge draw to the area, owing to its impressive craftsmanship created in traditional methods, even by the standards of the day. The docks which helped make the town so iconic and recognisable are still an attractive feature of the area, with many working boats still choosing to call it home. The Naturospace is a wildlife centre that specialises in exotic birds and butterflies, allowing visitors to get up close to some of these rare and otherwise unlikely to be seen animals. Alternatively, Le Jardin des Personnalites offers stunning outdoor views including large ponds and well kept green areas right next to where the Seine joins the English Channel. The town can bea easily accessed by boat or by road, with nearby access from the A29 road. 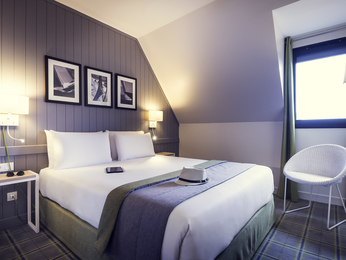 Booking a hotel in Honfleur with AccorHotels couldn't be easier. Simply browse our selection of hotels below and choose one that best suits your needs. Booking online with AccorHotels offers a host of benefits, including our Best Price Guarantee and last minute and real-time room availability.